CPQ? is set for explosive market growth. Here’s why it should be a part of your business. CPQ stands for Configure Price Quote and is a software that can improve the buying experience of your customers. Multi-channel Configure Price Quote (CPQ) solutions can immensely help your business and your customers. CPQ platforms do this by making it easier for your sales representatives and dealers to have all of the information they need at hand when helping a customer so that the customer can make a buying decision on the spot. 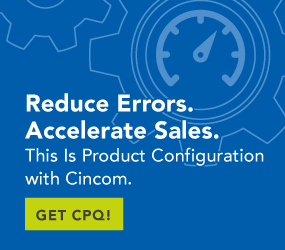 Cincom’s CPQ platform starts with product configuration. The application will create a real-time price and quote of the specified configurations and then deliver that price and quote to the customer or sales team. Configure Price Quote (CPQ) technology has been a fundamental business driver for decades, according to Forbes. It used to be what was used behind closed doors, addressing complex sales orders from sales reps and customers. CPQ technology is no longer only being used for complex sales. More industries are using this technology. Once the domain of manufacturing, CPQ technology is now moving beyond this industry and is being used in industries such as financial services, media and entertainment, high-tech, healthcare and communications. The year 2017 looks to be the time when CPQ technology drives innovation and makes an ever-stronger case for being positioned as a core business tool of the future. If you ask anyone in Marketing which is more effective, product selling or benefit selling, most will tell you the latter is more important. Just look at Apple. They didn’t sell the iPod as a product, but more as a lifestyle option. They sold the value of the product, rather than the product itself. Unlike a Walkman or Discman, you could hold hundreds of songs on a sleek device that fits in your pocket. The cosmetic industry also sells on value rather than on treatments or procedures. Admittedly, their value is not only how much better you will feel about yourself after you’ve gotten a treatment or procedure done, but it’s also very much about the value of the treatment rather than the price tag. That’s what customers want. They want to know what’s in it for them. Is it worth them exchanging their money (and their time) for your product or service? If you could show a potential customer the value they’ll get out of the purchase, and out of working with you rather than your competitor, your chances of converting them from a potential customer to a paying customer is much higher, and you also increase your chances of turning them into a repeat customer. When a member of your sales team goes to see a prospective customer, they can take the CPQ software with them on a tablet device. This allows them to answer all questions and explain the value of what the customer wants. The mobile nature of the software keeps salespeople from feeling awkward about not knowing answers or having to book another appointment to give them time to find out more information. Everything they need to know is there at their fingertips. Which, as has been written in another blog, “CPQ Solutions – Looking beyond ROI,” instills confidence in the buyer. There’s also the efficiency and accuracy of the CPQ software in delivering real-time prices and quotes. Eliminating the guesswork from quotes and prices as well as showing the buyer’s real-time information shows them the value of your sales team, your product and by extension, your company. The data from the last 12 months all seems to point to one thing: a CPQ solution is the best solution for businesses looking to grow their bottom line. With a range of products and options, multi-channel Configure Price Quote could be what your business is looking for to increase sales and customer retention.